(WBIR - Claiborne County) An East Tennessee elementary school principal deserves an 'A' for his enthusiasm and dance skills. 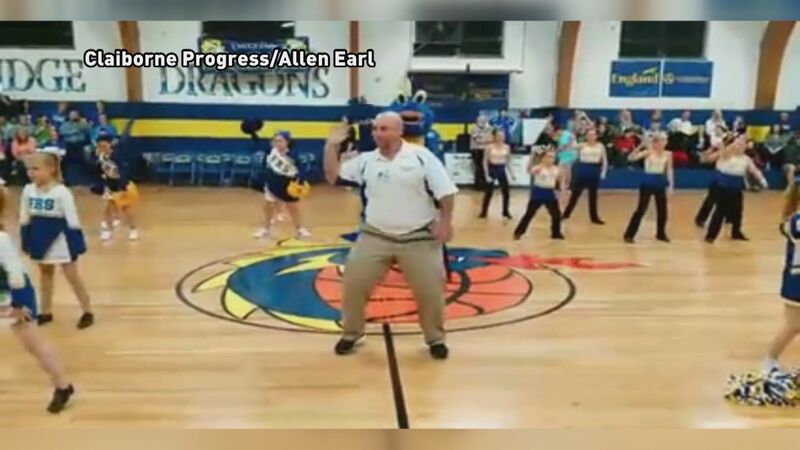 Forge Ridge Elementary School Principal Travis Bailey danced Monday night with the school's cheerleaders and dance team in between basketball games being held at the Claiborne County school. Assistant Principal Amy Pendleton told 10News that this is Bailey's first year as the school's principal and while they had planned to introduce him to the crowd Monday, not a lot of planning went into him joining in on the dance routine. She said the coach and kids on the team asked if he would dance with them, and he said yes. She described Bailey as being very supportive of the dance department. Pendleton said lots of kids and teachers were talking Tuesday about their principal's fun dancing.